VisiPak clear mailing tubes are an ideal shipping alternative for increasing response rates on direct mail pieces or simply adding to the aesthetic appeal of a mailer. These cylindrical-shaped mailing tubes ensure that your offering will stand out from the crowd! 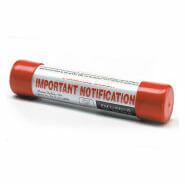 The clear nature of these plastic tubes also make them an excellent choice for dealing with the safety concerns surrounding mail. All sizes in stock and available for immediate shipment. Many sizes are available in ready-to-ship stock lengths. All sizes can be made to your desired length. To inquire about a size that is not stocked, please contact us using our Request Quote Form or by phone at 1.800.949.1141. Can’t find what you need? 800-949-1141. Change sort order by clicking on column headers. Click a cap image to learn more. I.D. refers to Inside Dimension and O.D. refers to Outside Dimension. Tube-velopes® is a registered trademark of Sinclair & Rush, Inc.